The Large Round Box design has quite a bit more room inside for treasures and trickets. Special instructions on how to use sheet glass included. 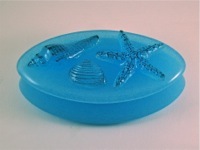 Learn how to prime, fill, and fire Colour de Verre Large Round Box mold. 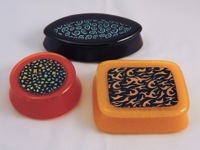 This project sheet provides the reader with all the basics – fill weights, schedules, and techniques – for using Colour de Verre’s box base and lid casting molds. 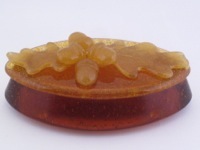 This oval box is cast in the palest amber and trimmed with smaller castings in the same shade. 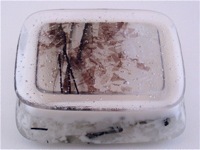 It is reminiscent of rustic Orna Wood boxes sold at national park gift stores in the 50’s. 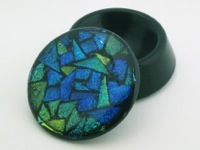 CBS's Crinklized and Borderline Pattern Dichroic are combined with Colour de Verre's Box Molds to create these very impressive and quite showy boxes. They are perfect gifts. 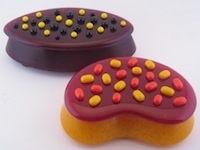 Millefiori give these sweet, little, glass boxes an old-world charm. 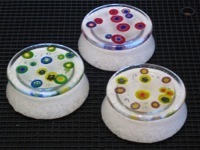 The white bases have an interesting color “texture” that doesn’t compete with the millefiori’s subtle colors. This project sheet illustrates how to use ZYP Boron Nitride primer (Formerly MR-97) in conjunction with Color de Verre’s box molds. The ZYP speeds mold priming and clean-up, but a few guidelines should be observed to get optimal results. 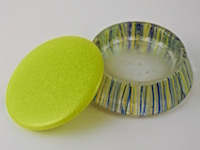 Like most studios, our studio has a box of interesting glass remnants too beautiful to just to toss away. The Winter Box project was inspired by a small rectangle of Uroboros Winter Collage glass left over from a bigger project. 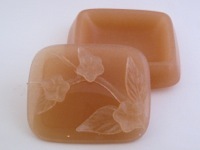 Peach blossoms, branches, and leaf castings are tack fused to the lid of an elliptical box creating a look reminiscent 1920’s European glass. Very pale, translucent colors were chosen as not to distract from the classic design. Flowers fade and chocolate is too tempting. 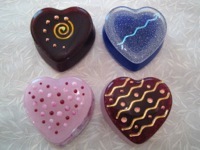 However, these heart boxes will be a lasting token of love or friendship. 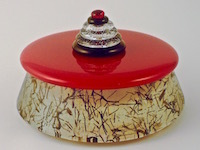 This project uses our Round Box and Lid mold to create a elegant cache perfect for rings and other special mementos.